Before you can reasonably get started with any kind of blogging, it’s critical that you think carefully about the niche you’d like to operate in. If you pick the wrong niche, you might waste time moving toward the wrong direction. Make every attempt to avoid that trap. Trust me. There’s nothing worse than putting your heart and soul into a project, and never getting rewarded for your efforts. This post will guide all the way through selecting the niche you’d like to dominate. This post will prevent you from getting into the wrong niche, and make the process easy to understand. This process requires diligence. The more you actively participate with the “ins and outs” of your niche start getting personally involved in it, the sooner “your place” becomes clear. The Renegade Blog team understands this is a hot topic. We ask that if you do have questions, you articulate them as clear and specific as you can in the comments section. We’ll be responsive to your questions. I recently listened to an interview with a well known internet marketer. He was asked what influenced him to be so successful. That’s when he shared a book written by Jim Collins called “Good to Great,” and specifically, this thing called the hedgehog concept. I’m going to summarize in my own words what caught my attention about this interview, Collins’ book and how you select a niche for blogging. The hedgehog is only good at ONE thing. Whenever he gets attacked by the fox, he just rolls into a ball. The fox can’t do anything. The hedgehog has these little spikes coming out, and the fox is useless. He can’t touch the hedgehog. The fox tries a bunch of new strategies every single day to try and attack the hedgehog. The fox is unsuccessful. The hedgehog has mastered the art of rolling up into a ball and extending its spikes. The fox hasn’t mastered anything. The hedgehog sticks with one thing and does it really well. The fox is always trying new things but never sticks with any one thing long enough to be any good. 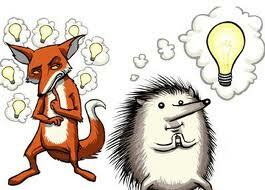 The fox approaches the hedgehog from the top. From the bottom. From the right, and from the left. No luck. Not happening. Can you guess the analogy here? Well for starters, you want to be like the hedgehog. Not the fox. Have you heard of SOS? It stands for Shiny Object Syndrome. And you spend the money because you tell yourself you need the results. But you don’t actually get any results. Has this happened more than once for you? For some of you reading this, it’s a pattern. Well that’s just like the fox. On the other hand, if you’re a hedgehog, you can find that one thing that you’re extremely good at. In this case, it’s curling up in a tight ball and extending it’s spikes. In fact, the hedgehog is the best in the world at doing this. No one is better. You want to be the hedgehog, and be the best at one thing. Best in your industry. Or best in your town or best in your community. Or best in your company. You buy things that help you stay on top of being the best, or fill small cracks in the sidewalks that sustain your dominance. This can only be done once you have a clearly defined niche. Do this and you become totally unstoppable. It was that interview with that well known internet marketer that I first heard the hedgehog story. Since then, I’ve been studying the successes of other six and seven figure internet network marketers. And even working with them like I am now with Ann Sieg. And from what I observe, they all follow that exact same model in their own life and business. They become really great at doing ONE thing. I believe strongly that it’s the number one reason for their online success. Jim Collins, the author of “Good to Great” did a massive amount of research on this. He figured out exactly what it was that gave some -in this case- companies that have that extra “edge” and have the ability to reach that breakthrough point to totally dominate the niche they are operating in. Although Jim did his research on companies, the same can be applied to individuals. 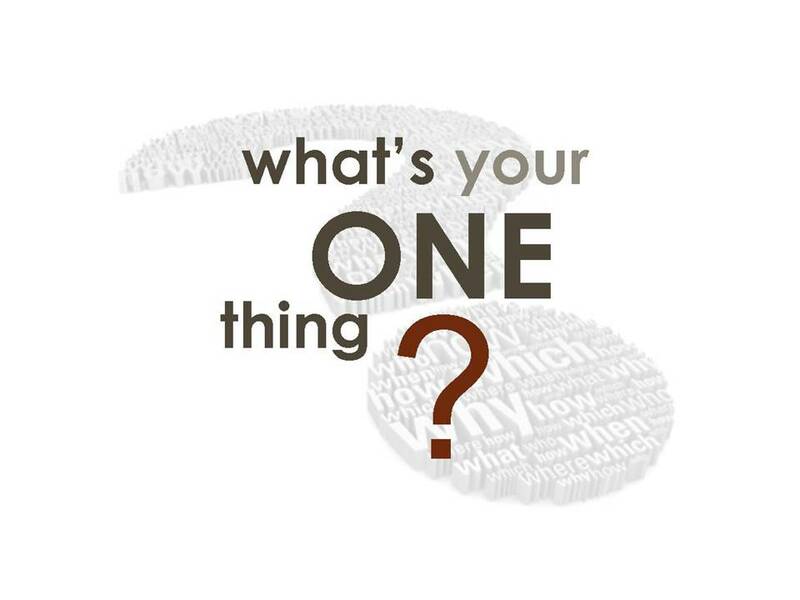 –What you or your organisation are truly passionate about. –How you are able to make money from it. Or as he calls it, your profit per “x.” In our world, this could be broken down into profit per lead and profit per customer. Let’s look at each of these three areas as they relate to determining your perfect niche topic for your blog. First, you’re going to have to get clear about what you are you truly passionate about. Based upon my nine years of elementary and middle school teaching in the public school system, I’ve formulated this theory. We knew exactly what we were passionate about on an intuitive level when we were much younger. Then we were conditioned by our environment (parents, siblings, friends, other peoples’ opinions, television, media and a mixed bag of other things). Most of us have forgotten what our true calling is. The only way back is to do some deep (yet worthwhile) “soul searching” to peel away those years of conditioning. The key is to get back to knowing what you love doing. This is often a difficult process. It requires that you seriously start thinking about what makes you tick. For that, I have another book recommendation. I haven’t read it yet, but a few others I know have and they’re raving. It’s called “Your Life, Your Legacy” by Roger Hamilton. Inside his book, Hamilton helps you figure out how to get into a state of being where you’re doing things that you are passionate about and absolutely love doing. Bad news! Just knowing what you’re passionate about is not enough. It’s only 1/3 the battle. That’s why when some people teach about the importance of finding your passion it comes across as “airy fairy” to me. Finding your passion is necessary, but not even half the battle. There are two other -very practical- things to consider. This next thing relates to your level of skill in a certain area, which is based on your passion. The second thing you need to figure out is the exact thing that you could become the best at, or at least very competent at. For example, say you’re really passionate about eating healthy. 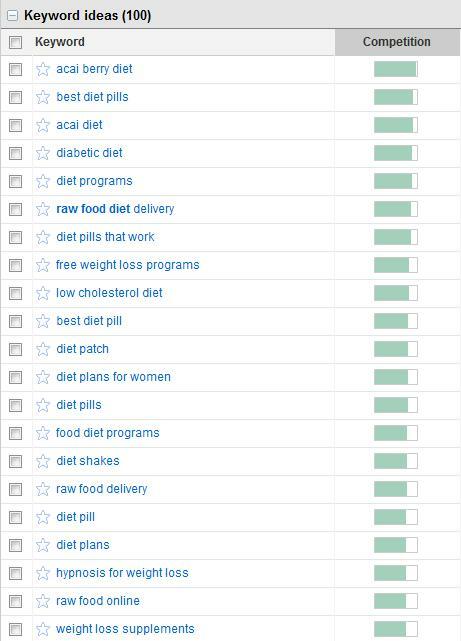 More specifically about eating a diet largely focused on raw food. An example of a core skill you could develop could be that of the 21 day cleanse where coffee is out. Gluten is out. Dairy and animal flesh – so long. Refined sugars and processed carbs, gone! Greens are in. Raw foods are in, etc. Over a period of time, if you focussed on it, you could become a leading authority on the subject. Achieve that, and you’re in a very powerful position. Now you’re getting warmer. 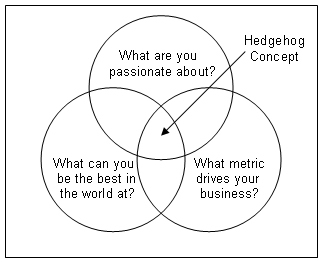 You’ve met 2 out of 3 of the key Hedgehog concept factors. 2 out of 3 isn’t bad, but it’s not great. There’s one more, and this is so vital. The third and critical factor is answering the question, “Is there a way to make money from it? There is no use if you’re operating in a niche that you’re totally passionate about, and developed a strong skill in it, but there is not potential for making money from it! How do you know if there is potential for making money in your niche? There are two easy tests you can apply online to help you figure out whether your niche will be profitable or not. Let me give you a quick example of “profit per ‘x. '” I know someone whom I work with very closely who is extremely passionate about building internet marketing funnels. He has become an expert at sending paid traffic to a lead capture page, converting that traffic into leads, and selling them on a low priced information product that truly is valuable, and makes the buyer feel like they got the better of the deal. Furthermore, this person is exceptional at keeping that customer for life, and further monetizing years on down the road. –Do the people in your niche have money to spend? Is there proof they are already spending money in your niche? Part One — Are there enough people in your niche? The Google keyword tool will figure it out for you. It finds out how many people are searching for the keywords that relate to your niche. 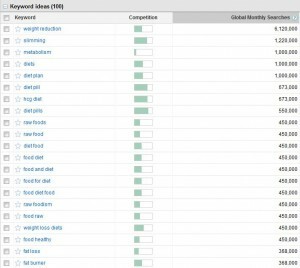 Look at the “Global Monthly Search Volume” column for the results related to your keyword phrases. Part Two — Do people in your niche have any money? Look for evidence that other companies are spending advertising money on the keywords in your niche. 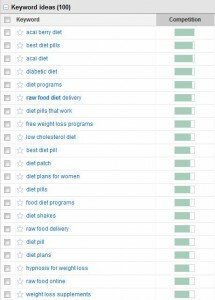 Look at the “Competition” column for your keyword phrases. Let’s acknowledge that choosing a niche topic is important. But don’t spend sleepless nights over it. That only creates paralysis. –Pick a niche topic that you will love for sure. No doubts. –Pick a niche topic you know there will be enough people that they will pay for it with money. A lot of this stuff you just have to figure out as you go. There isn’t always a defining moment where the clouds part, and the god of niche topic selection hands you the perfect niche. In reality, you refine and define until it meets your needs. My best advice is to get started. A good plan ruthlessly implemented is better than a great plan never realized. You don’t have to always get it right, you DO have to get it going. Even if you’re not entirely sure which niche to select, just pick one and get started. You’ll quickly figure out all the “ins and outs” of your niche as soon as you start getting involved in it. Once you’re clear on which niche you should be operating in, you’re ready to move onto the next step, which is learning how to easily create high quality flagship blog content. If yes, share it. We prefer Facebook. Or even better, email a friend to tell him/her about The Renegade Blog. We understand this is a hot topic. If you do have questions, write them clearly and be specific. We want to be responsive to your questions in the comments section. I LOVED this article. You couldn’t have spelled out finding your niche more clearly, simply and eloquently. I really enjoyed the hedgehog analogy and can speak from experience that finding your perfect niche is an ongoing process. I have recently had to shift gears and “reset” my business so I can be positioned in the place I want to, need to and am passionate about being in. You’re a great example of a person who has rolled up their sleeves and engaged in the process. You’ve never stopped and dwelled on not knowing your niche, you’re doing the marketing and following through on all that you are passionate about. And that is how you’ve found the right path with the right people. Thank you for commenting. Thank you for sharing this with me. I am trying to set up a website and e-mail to mass mail advertisements for Herbalife. I am thinking of targeting audiences from 60 years of age. I am not computer literate nor do I understand how it all works. I need to know where to search this information and find out the best way to do this. Indeed, I found your blog very interesting and helpful. Excellent article! You are absolutely bang on about the need a niche that you can get passionate about. One of my coaches told me that attitudes are contagious and I needed to make sure mine was worth catching. We can’t expect our team to be more excited than we are nor can we expect them to do more than we are prepared to do. Leaders set the pace, and like you said to be successful we need to find something that gets us excited and has the ability to put us into profit when we execute our action plan. Go after your passion with laser like focus – thanks for the post, awesome stuff! You’re welcome Chuck. You did a VERY nice job of summarizing it too. Sounds like you’re living it. Right on. Come back again. Appreciate your comment. This is another Excellent article! You truly have a gift of writing and education. I really like how you said that defining one’s niche is a journey and the important thing is to get started. I totally agree. I think we need to be ever learning and tweaking and refining our niche. As we make progress we have more information to work with. For instance, after blogging for 3 months, we now have google analytics to help us decipher what is speaking to people and what is not. Then we can adjust and go deeper in that area. I totally agree with you on all three points. I found the part about the layers that have conditioned us over the years away from our true calling. Now that’s interesting. How do you remove those layers? Is there a simple way to do it, or again does this just come back to defining and refining? Thanks so much for posting such great content! Honest answer: I don’t know. I know it’s not simple. I think you’re right about the constant defining and refining and just being really honest with ourselves, our goals, our desires, etc. Thanks as always for your continued support of our content. Awesome analogy. Lots of folks get all wound up about making everything perfect instead of just starting and getting better everyday from there. I believe taking action is the best learning experience in the world and it’s okay if you look like a fool at first because it’s a great start none the less. And majority won’t even start because they fear looking silly. It’s powerful not to care and to focus on your own improvements. Good point. Most have fear, and won’t do the work and step out of their comfort zone. I can say from my own experience that my biggest leaps have come as a result of prolonged discomfort. I’m to the point now that if I feel comfortable for too long I start getting worried I’m not growing. Everyone has a different threshold for it, but one must start somewhere. I appreciate seeing you here at the blog. Glad you’re enjoying the content. What perfect timing! This topic of finding your niche is exactly what I’m working on at the moment. Thank you for not only talking about the importance of finding our niche but also giving us tools and guidelines to determine if it will be profitable or not. Great “seeing” you. I guess we’re in sync. Yes, I find that Google’s keyword tool is good for a lot of things. Glad you found it helpful. Drop me an email if you need any help or have any questions. A great post and well written. Thank you for the steps to take to see if it is a profitable niche. I am in this process now and moving closer to taking steps forward. You are right at some point you just have to jump! Yes Jennifer – JUMP! You know what to do. a marketer “does” than what they “say”. However, much can be learned from your methodology for soliciting blog comments. It isn’t easy to get people to contribute and comment. comments, which encourages more comments. that, along with your topic, nurtures trust and participation. Thanks Michael. I always make an effort to bring in other peoples’ thoughts, opinions and seek their contributions in any shape or form. We’re all learning. Some of us are well on our way. Some of us are just getting started, and I suspect there are a lot of us somewhere in between. That’s what I think is so powerful about blogging. It can bring in so many peoples’ knowledge. As much as I appreciate your comment, I have to say that we’re just scratching the surface. The entire 80/20 Marketing team is deeply committed to building this blog into one heck of a resource. I would love it if you wanted to contribute Michael. I respect your work. Keep coming. Hi, great article. What would you suggest as a good threshold for the global monthly search volume ( or the USA volume) – ie at what point is the volume high enough to be worth pursuing (for top keywords) versus too small to invest the time and effort in?? Thoughts?? GREAT question! That’s a money question. I will tell you what I’ve had success with as just one individual doing all that I can do with my own means. . . Go for the low hanging fruit. Save the broad keywords for the big dogs with a team of folks. 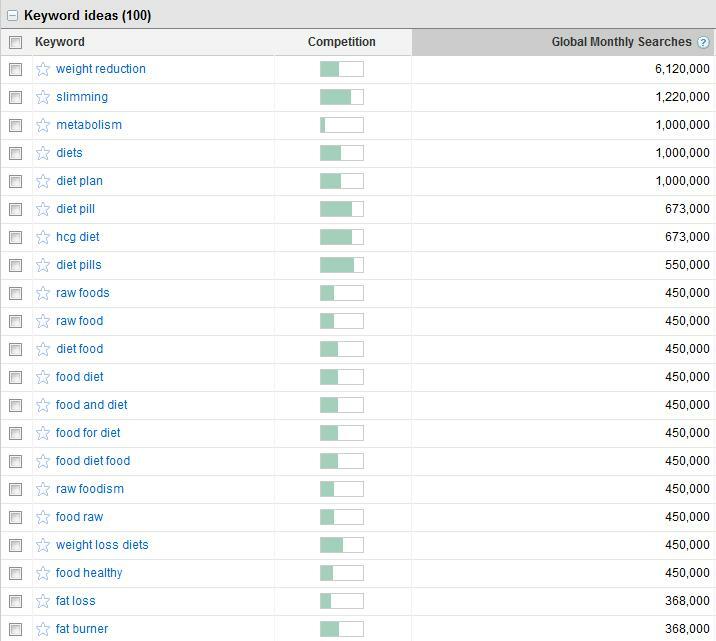 The average person should start out with keywords that aren’t getting more than 15,000 monthly searches using the Google keyword tool. If you can rank for that then up the ante and go for 30,000. A lot of this requires testing. Of course, your content always has to be good. That’s a given. Let’s take the keyword “Pampered Chef Products” (I’m assuming you might be with Pampered Chef based upon your email name). That gets 14,800 global monthly searches and has medium competition. That would be a good one to go for. This is a great post. Need to print it off and post it over my desk. Well done. Thanks for putting in the work to write a truly amazing blog. I don’t work with a network marketing company yet….but I have been studying and learning network marketing skills, not only for when I do join a company, but for my current business as well. I have been reading a series of these similar marketing with a blog type posts and I am confused on what to do. I am in the beauty industry. I see that there is a lot of competition with pure, natural and organic products….but not a lot of global traffic. As for the other way around… you have people with the most global traffic being basic searching…like “skin care” or “cosmetics” and the competition is low. So I am unsure what to do or think about this. My passion is beauty, skin care and makeup. I am an actual hair stylist and makeup artist and I love to educating others on products and how to achieve results at home. I feel this will help me for my consumers. But what about getting people to join my company??? I feel the only way to do that is to educate on business. I know I want to be with successful people and I am drawn to the business savvy as well. So How do I combine the 2? There is always a need for consumers…and I don’t want to forget about them and just focus on business. should I have 2 separate blogs??? That’s all you need to succeed. Honestly, don’t over complicate things. Create one blog, and share your passion and expertise. In the case of beauty, I recommend video too. Build a mailing list, and keep bringing on the value you have offer. If you do that long enough, you’ll understand the business side. But what you have in you already is enough. This is all extremely helpful info but I am still at a crossroads, you see I am a massage therapist, a very successful one. My niche is getting and retaining clients. I want to help others do this with my blog. Also most massage therapists are not successful financially so I would like to teach them on how to be more successful in their practice as well as supplement their income by joining something like an MLM opportunity. I think massage gives you such leverage to supplement this way but I am still learning MLM myself. Now my question is can my blog mutate the 2 or do I have to choose to strictly sought after the attention of other MLMers since most LMTs will not know to search for this opportunity as I am trying to build my MLM too. I feel like I am reading conflicting info, one says choose a niche to create content for other network marketers or MLMers because they’re already buying into and looking for this info, others say be an expert in what you know a lot about which is massage. My brain is numb! Need to move forward and hoping you could clarify. I have my own personal-authors blog and I’m always confused on what to write about. It’s mostly just writing tips and top lists and what not. Great info! I know I’m a good writer, but trying to find the perfect time to write is never gonna happen. Scheduling it now for 3x week . . . hopefully will follow through more better!! Thanks for your insights and sharing . . so much to learn now every day. Better start writing though, I lose track of time when I’m learning stuff online! Before you can get started with blogging, it’s critical to think about the niche you’d like to operate in. 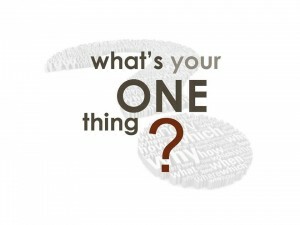 This post guides you through selecting the niche you’d like to dominate….